At Kewell Converters we provide a range of industrial closed cell foam to suit any number of applications and requirements. These are the kind of foams that are commonly used for protective packaging, case inserts and other industrial safety components. Our foams are regularly checked to ensure that our clients receive their orders in the best possible condition. Closed cell foams are so widely used due to their extremely flexible characteristics. They are durable, resilient, lightweight and waterproof. 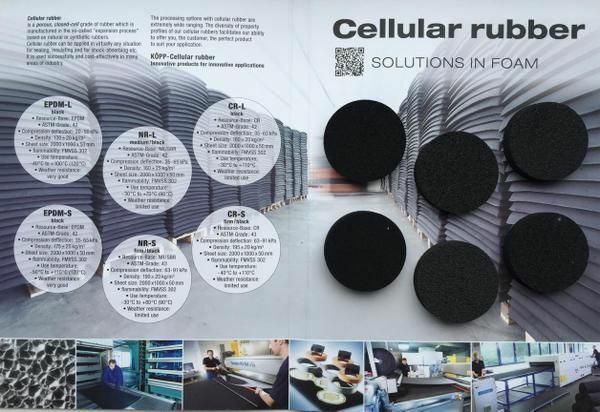 We can offer a KOEP (KÖPP) Closed Cell Sponge Rubber (Expanded Rubber) foam range used extensively by the automotive industry and other industrial sectors. 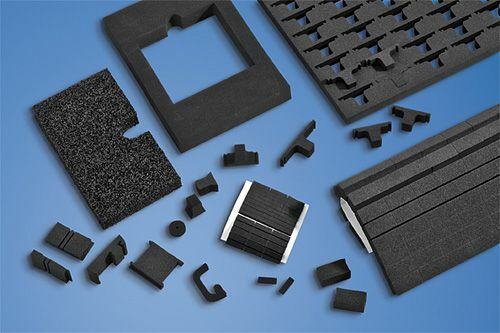 Cellular Rubber Blocks are materials with exceptional properties and characteristics such as Anti-Vibration, Compression Set, Oil Resistance and Sealing, to mention a few. Materials on demand include EPDM – Ethylene-Propylene- Diene-Monomer Rubber CR – Chloroprene Rubber, commonly known as Neoprene®, Coloured Materials, Polymeric Blends, Semi-Closed Cell EPDM, M1/F1 classified material, Materials in accordance with UL94. We can supply all sectors of industry with sheets, profiles, mouldings, strips, punched items and cut-outs. Self-adhesive versions are available too. Expanded rubber, otherwise known as closed-cell sponge foam or cellular rubber has an exceptional range of properties which allow it to perform superbly in the automotive industry and across other sectors. Request a quote from us today if you are looking for closed cell expanded rubber foam. Closed cell foams are popular in a wide number of industries because they have a number of great characteristics. It produces minimal vibration and has high energy absorption properties. It resists water, oil, ozone and detrimental weather conditions. It's an excellent sealant and will withstand a wide range of temperatures. It also has low levels of flammability and smoke release in the event of a fire. This makes the foam perfect for a wide range of industrial applications where other insulators can burn easily and become hazardous. KCL can provide a number of expanded rubber block materials on demand. There are a number of different types of closed cell foam that have a range of different properties. If you are unsure which material is best to suit your needs the get in touch with us today to request a quote. EPDM - Ethylene-Propylene-Diene-Monomer Rubber - outstanding resistance to heat, ozone and steam, great insulator - often used for seals in the automotive industry. Materials in accordance with UL94 - The standard for flammability from lowest (least flame-retardant) to highest (most flame-retardant). 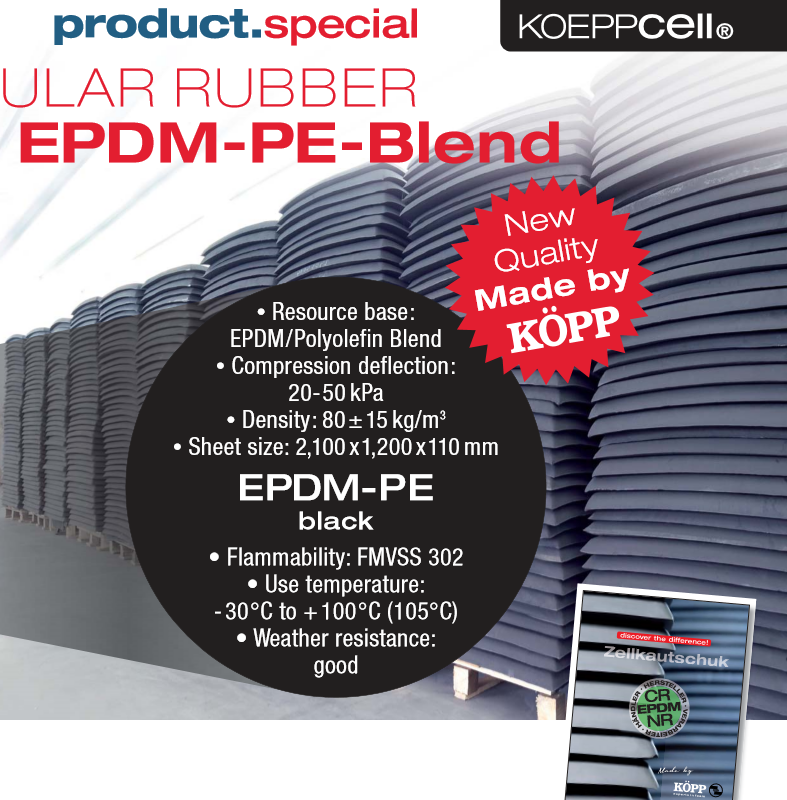 You will find KÖPP cellular rubber nearly everywhere in sealing, damping, insulating and shock absorbing applications. This cost-effective material is used successfully throughout industry. The material can be supplied in sheets and strips. It can be punched, milled or customised to your requirements. There are many ways of processing and working KÖPP cellular rubber. It can also be produced in a self-adhesive version. Our expert team is on hand to provide advice or answer any questions that you may have. Whether you want more information about the closed cell foams that we offer, or you are enquiring for another reason, we can help you achieve the best results. You can also find more information about closed cell foam here. Here at KCL we produce a brilliant range of industrial closed cell foams, that are available for bespoke needs. This means that there are different sizes and colours available in order for us to be able to fulfil every need and desire of our clients. Throughout the production our foams are regularly checked in order to ensure that it is in the very best condition for our clients, this way we are able to remove any materials which are not up to standards.